Remove Outlook Calendar duplicates. Remove duplicate Calendar events and appointments. If you import or sync Calendar items into Outlook, and some items already exist in the Calendar folder, this action creates duplicate Calendar items. This often occurs with all-day events such as holidays and birthdays. Due to unique merge algorithm, Duplicate Remover will intelligently merge all duplicate Calendar events and convert all 24-hour events into all-day events. Remove duplicate Calendar events quickly and efficiently. With just one click of a button you will merge or remove Calendar duplicate items in Outlook Calendar folder. 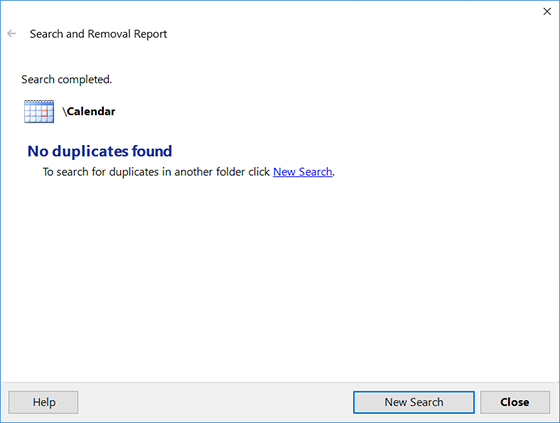 Once the search is complete, Duplicate Remover will create a simple report, that shows how many items were merged or removed. All removed duplicates will be backed up automatically to the Deleted items folder. No data will ever be lost while removing Outlook duplicates. Even if hundreds of duplicate items are spotted they can be removed in just a few seconds.